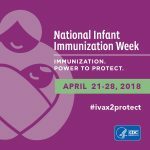 This week, the Virginia Department of Health celebrates National Infant Immunization Week (NIIW). NIIW is an annual observance that highlights the importance of vaccines for infants. The week celebrates the work of immunization programs and their partners in promoting healthy communities. As part of NIIW, one healthcare provider in Virginia is selected as the state winner of the CDC Childhood Immunization Champion Award. This award recognizes a provider who contributes to public health by promoting childhood immunization. This year’s CDC Childhood Immunization Champion Award winner is Dr. Cyrelda Fermin of Alexandria, VA. Dr. Fermin is a pediatrician who speaks English, Filipino, and Spanish. She uses her multilingual abilities to provide care for families who are not native English speakers. Through her efforts, she has helped ensure high pediatric immunization rates in her community. Congratulations, Dr. Fermin! And congratulations to Donna Deadrick of Carilion Children’s Pediatric Medicine and Cathie Harrington of Wythe Physicians Practices who were also nominated. The hard work of healthcare professionals across the state helps to ensure a healthy start for Virginia’s youngest residents. VDH thanks everyone who serves as an immunization champion for their community!